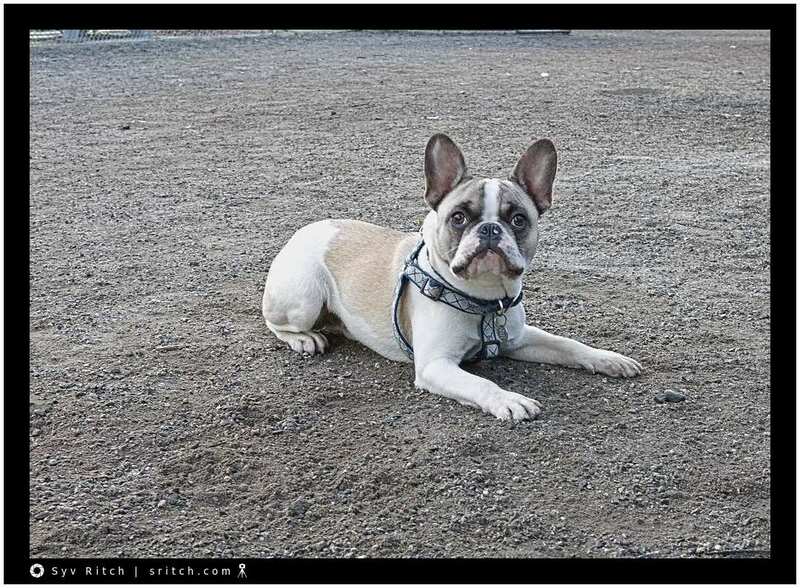 Reggie is a 21 month old Frenchie, aka a French Bulldog. He wants to play with my dog. He does all the right moves: lay down, the elbows, wait for the other dog to come… The problem is my dog, Dodoïte, doesn’t play. He doesn’t know how, he grew in a cage in a garage. That’s when Reggie got ‘pissed off’ and became Mr Nasty. He started to go around Dodoïte and bite him on the legs. He even got my dog to growl back (I’m teaching him to bark!) and that’s when I had to intervene. I started doing what I call the ‘dance’. I place myself between Dodoïte and Reggie and my job is to stay in between the two, while Reggie tries to go around me. I’m blocking him. That’s when Reggie’s owner came and took him. Then they walked away.